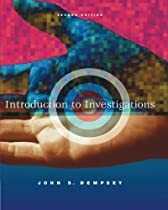 INTRODUCTION TO INVESTIGATIONS, Second Edition is a basic introductory text for college students who are interested in learning who investigators are, what they do, and how they do it. Dempsey has designed a text that gives students a general overview of investigations so they can understand why and how investigations are conducted. This text also introduces students to what types of jobs are available in the investigating industry and what skills are needed to obtain these jobs.